I don’t spend very much on eating out. I know how to save more than I earn. We could put away 50% of our income easily if I tried a little harder. These are some of the things I tell myself. Are they really true? As time passes, it’s easy to develop ideas about yourself and your spending patterns. The best way to examine what’s reality and what’s ingrained perceptions is to take a deep hard look at the numbers. For 2017, each month, I’ve gone back and looked at the credit card receipts and bank transactions to see what I’ve spent. Now, like any of our figures, this isn’t perfect. Derek’s financials aren’t calculated here. Almost no 100% cash transactions are captured because I don’t track cash. I also hardly use cash, so it’s unlikely much is missing. Maybe $40 here or there that was spent at a cash only diner or a cash gift. In March, I posted our budget and noted how our spending priorities mean we’ll splurge on travel, but kick it in holey socks. So, how good or bad did I do thus far in 2017? Rent – We had a rent increase hit us effective May 2017. It was only $50/month, but still, that’s an increase I wish wasn’t there. Electric – I thought for sure we’d be tracking worse here. Our electric bills of long ago used to be around $50. Since kiddo we spend a lot more time at home and bills have increased. Last summer we had an over $200 electric bill because we used a lot of AC. I’m happy to see our efforts at energy conservation and mindfulness are paying off and that it’s pretty close to budget thus far. Phone – I snagged a corporate discount for my cell phone bill which is why this went down. We pay for four phone lines (Derek, myself, my mom, and my little brother). Internet – Our internet provider raises the rate on you every year unless you call to complain and see about securing a new customer rate. I haven’t called yet so we’ve seen a $10/month increase for a few months now. Local Transit – I’m surprised that we’re spending less getting around Boston than I would’ve thought. Laundry – I’m also pleasantly surprised that we’ve managed to pinch a few pennies on the cost to do our laundry in the building’s machines. Health Insurance – I knew this would come under budget. My plan year renewed in April. For this open enrollment cycle, I chose a lower premium PPO family plan that still has great coverage and reasonable deductibles. I even added dental again and still saved money off of my HMO plan from last year. Student Loans – I wanted to pay extra to student loans, but ultimately didn’t follow through. This is the cost for making only minimum payments. Grocery – I thought for sure we were burning money on our grocery bill, but apparently my perceptions don’t match reality. 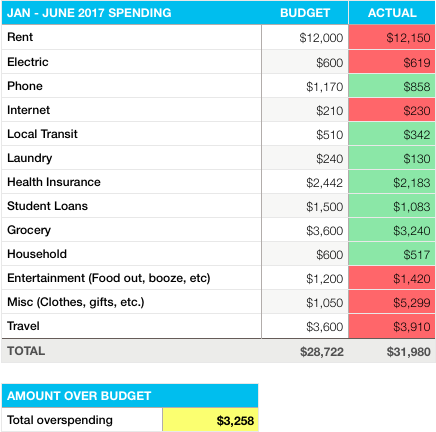 I still think $600/month is too much to feed a family of three, but it’s not outrageously high and we’re not quite spending that much. Household – Surprised to see we’ve spent less on diapers and such than expected. Entertainment – We’re pretty close to budget. The killer has been the number of times I’ve bought lunch out at work because I forgot to bring something. Also, there’s a handful of times we opted for more than a six pack for our Friday night home hang drinking. I regret those purchases because we blew more on beer and I tend to feel crummy now if I drink more than three strong beers in a night. Misc – HOW HORRIBLY BAD AM I AT ESTIMATING? I’ve tracked my money for a while, but seriously. Whut. I’m shocked I failed this bad at estimating things that may hit our bank accounts this year. Life and renters insurance is around $1000/year. So this category as a whole was under-estimated. A big part of this extra $4,000 is the tax bill we got smacked with because I messed up health insurance tax credits and self-employment income deductions. Also we bought Lu a mattress and I spent some money on blogging although I’ve yet to earn income from it. Travel – Pretty close to estimated. There’s future travel in there. I’m planning on a cruise next February with my mom and Lu. We’re on track to spend about $60,000 this year. For a family of three living in Boston, that’s not terrible. We’re going to earn about $120,000. I’d say I’m not too shabby, but there’s still more for me to learn and I could be better. We really don’t spend much eating out. But wow we spend a lot on travel. But, that’s what we care about. And rent is just so so so so so high (even though we’ve got cheap rent on a two bedroom apartment in Boston). It’s over a third of our total spending. I still want to think yes, but staring at the math, knowing we could scrimp a little, I realize unless we make a dramatic change to reduce housing costs that we could maybe approach a 30-40% savings rate currently. We spent 50%. Then the IRS wants their cut. So, unless we can scrimp and cut back more, we’re not going to get to a 50% savings rate.